Originally designed for deep-sea research, the Russian-made Gnome underwater robot is proving useful for various other applications, from 3D imaging to monitoring fish ponds. The robot’s manufacturers are seeing growing international demand for the Gnome, with sales reaching $1.25 million in 2013, and plans afoot to expand into the hobby market. Around 60 years ago, engineers at Russia’s Institute of Oceanology created the first prototype of an underwater robot for use in deep-sea research, beginning a series of upgrades and improvements that has continued to the present day. Russia has now been successfully exporting underwater Gnomes, so called due to their small size, for the last 15 years. Before the 1990s, the majority of remotely operated underwater vehicles (commonly referred to as ROVs) weighed hundreds of kilograms and cost hundreds of thousands of dollars. 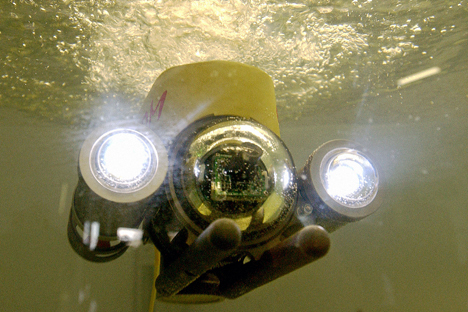 In 1994, the Russian Academy of Sciences’ Institute of Oceanology began developing a mini-ROV. The institute already had its technical facilities and engineers, whose work had resulted in the creation, in 1954, of the world’s first automatic device for taking photographs deep underwater. In 1998, the institute’s team presented their mini-ROV device at a conference in the U.S., and in 1999, the Gnome was patented. A Sony video camera was placed in an aluminum case. The case was fitted with LEDs, several electric motors and a cable (for power supply and video transmission as well as for the operator aboard a ship to send commands to the underwater robot). The operator controlled the device with the help of a joystick, with the video signal from the camera recorded and played back via a videophone. The key feature was the cable reel, which was attached not to the ship deck or on shore but behind the device itself, considerably reducing the amount of energy it took to lay out the cable. Currently Gnomes are sold by two companies established by employees of the Institute of Oceanology: Indel Partner (since 2001) and Underwater Robotics (since 2012). Their first customers came from abroad. For instance, Gnomes are used at the Oceanographic Museum of Monaco and at a college underwater park in Croatia. The most active buyers were fish farms in Chile, which found Gnomes to be a good value-for-money and easy to operate option for monitoring fish ponds. Gnomes are also sold on the domestic market, where the Russian government is a major customer. In 2010–2013 alone, Indel Partner won 22.4 million rubles’ ($360,000) worth of tenders. For example, the Education and Science Ministry uses a modification of the device to monitor underwater communications and for 3D imaging of seabed relief. Gnomes are in great demand with the Emergencies Ministry too. Rescue teams use them to explore sunken ships and ammunition, containers with radioactive waste and other potentially dangerous objects in the Baltic, Black, and Caspian seas and the Sea of Japan. In 2013, underwater Gnomes generated 40 million rubles ($1.25 million at the 2013 exchange rate) in sales. In many cases, Gnomes replace divers and bulky equipment, especially where their use is made complicated by external conditions. A leading engineer with the ice navigation laboratory at the Arctic and Antarctic Research Institute, Anatoly Klein, told RBC that Gnomes were used to explore underwater parts of ice ridges and icebergs. “It is important when designing shipping routes and monitoring the existing ones,” he explained. Gnomes are also actively used in the technical monitoring of hydroelectric dams. The profit margin on the Gnome Baby model is 15-20 percent, while for more expensive models it can reach 100 percent. Some 10–15 percent of Indel Partner’s sales come from repairs and maintenance. The company’s current plans include designing a multi-engine model with hydroacoustic devices and a sonar, and two manipulators. Indel Partner hopes to have this ROV, which is expected to cost from 2 to 3 million rubles ($32,000-48,000), ready in 2015. The company is also planning to fit Gnome control stations with Wi-Fi modules, so that the robots can be followed not only by the operator. Another promising area is the development of hobby models for yachtsmen, divers and other underwater filming enthusiasts. The market, which is currently dominated by the U.S. company VideoRay, offers huge potential for the Russian manufacturers.